Sana'a is believed to be one of the oldest cities in the world, one that has continuously been inhabited over the centuries through times of drought, famine, war and major upheavals in social trends resulting from changes in its political and religious scenarios. 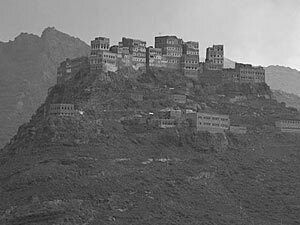 Traditions narrate the story of Shem, the son of Noah, who decided to found a new city for his people, and was led to the site of the present Sana'a by a bird. Here he lay down the basis of a city that was to survive for centuries and to witness the ups and downs of a variety of cultures and peoples. Sana'a was home to the Sabaean Empire during the 6th century BC. By the early 6th century AD, it had become the capital of the Himyarite dynasty. Written records as old as the 1st century AD provide an insight into the prevailing culture and social conditions during these periods of change. Sana'a also served as a strong military base for two mighty empires of the past – the Abyssinians and the Persians. With the advent of Christianity and the religious journeys of early missionaries, Sana'a began opening up to new waves of change, and churches became one of the more prominent public buildings. When Islam arrived in Yemen around the 7th century AD, it changed forever the look and feel of the ancient city. Towering minarets started to rise above the world’s first skyscrapers, and mosques taller and grander than the earliest churches sprang up, giving the city an interesting and unique skyline. Sana'a developed rapidly under various phases of growth of the Islamic empire. It prospered under the Caliphate during the 8th century, then under the Mamelukes during the 16th century, and finally under the Ottoman Empire after the fall of the Mamelukes. Sana'a remained under Ottoman occupation for a few centuries, when in 1918 Imam Yahya began ruling North Yemen and declared Sana'a his capital city. When the imamate was abolished after the 1962 revolution, Sana'a became a capital of the new Yemen Republic. This led to a rapid growth in population and infrastructure. Population, due to a large influx of migrants, began to double every four years. Sana'a remains today as the world’s fastest growing capital city.